As beer festival season draws to a close, the weather grows colder and the days become shorter, you feel a yearning inside for a taste of summers past and yet to come. From the darkness comes the light – a way to ring in the New Year in your favorite style! 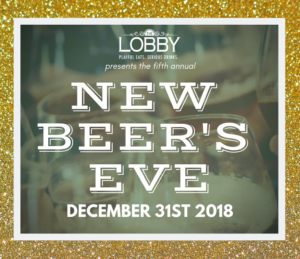 The Lobby presents the fifth annual New Beer’s Eve – a beer festival meets fancy schmancy New Year’s Eve party bash to save you from black tie affairs and kids with noisemakers at your in-laws house alike. Wear your favorite flannel and jeans or your best party dress, whatever makes this the New Year’s Eve event of your dreams! Join us for a three-course beer pairing dinner to start the night, a menu of all-you-can-drink packages to keep it simple and a live band to keep your feet moving! Eighteen of your favorite breweries will be on draft celebrating their 2018 original brews. As the ball drops at midnight enjoy a complimentary toast of your choice – a little bubbly or a draw from our midnight tapping of 2019’s first brew! There’s a balloon drop, too! More details will be released as the date gets closer, so stay tuned! Thank you Denver Westword for being our amazing media sponsor! The Lobby Denver, located near Coors Field in the heart of downtown. © 2018 The Lobby Denver. All rights reserved. Website Design, SEO Denver, and another great experience online by Rounded Digital.